Achenbach was one of the foremost German landscape painters of the 1800s. He was born in Düsseldorf in 1827 and died there in 1910. He was educated at the Düsseldorf Art Academy. He made trips to Italy, particularly to southern Italy, and most particularly to the area of Naples; his most representative work is of scenes in and near Naples, depicting not just landscape but the way of life of the people. 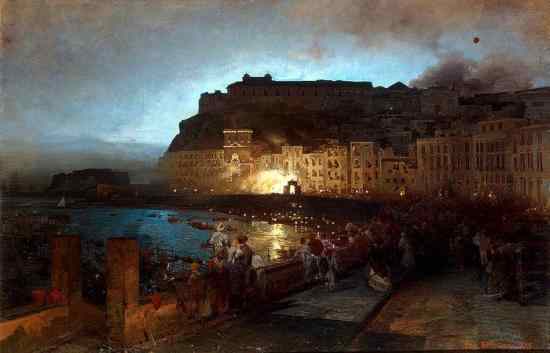 He has some beautiful paintings of bathers and fisherfolk on the beach with Vesuvius in the background, but this night scene (below) appealed to me: Fireworks in Naples, painted in 1875. It is currently in the collection of the Hermitage museum in St. Petersburg. The view is to the west just after sunset with the darkened Castel dell'Ovo at the extreme left. This view no longer exists today, as it is painted from the old Santa Lucia section of Naples. The lighted church below the height of Mt. Echia, just to the left of center (with the silhouetted fountain backlit by fireworks) is the Church of Santa Maria delle Catene. It still exists, but the street in front of it, via Santa Lucia, is now an inside road, having been cut off from the sea by entire square blocks of new buildings and a new outside coast road built during the great urban renewal, the Risanamento, at the end of the 1800s. That new area sits on land reclaimed from the ancient and picturesque small harbor of Santa Lucia seen in this painting. That harbor is gone.